Constraint satisfaction is a simple but powerful tool. Constraints identify the impossible and reduce the realm of possibilities to effectively focus on the possible, allowing for a natural declarative formulation of what must be satisfied, without expressing how. The field of constraint reasoning has matured over the last three decades with contributions from a diverse community of researchers in artificial intelligence, databases and programming languages, operations research, management science, and applied mathematics. Today, constraint problems are used to model cognitive tasks in vision, language comprehension, default reasoning, diagnosis, scheduling, temporal and spatial reasoning. 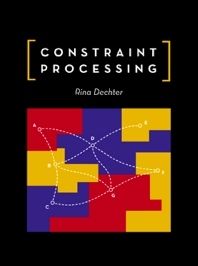 In Constraint Processing, Rina Dechter, synthesizes these contributions, along with her own significant work, to provide the first comprehensive examination of the theory that underlies constraint processing algorithms. Throughout, she focuses on fundamental tools and principles, emphasizing the representation and analysis of algorithms. Rina Dechter is a professor of Computer Science at the University of California, Irvine. She received her PhD in Computer Science at UCLA in 1985, a MS degree in Applied Mathematic from the Weizman Institute and a B.S in Mathematics and Ststistics from the Hebrew University, Jerusalem. Her research centers on computational aspects of automated reasoning and knowledge representation including search, constraint processing and probabilistic reasoning. Professor Dechter has authored over 50 research papers, and has served on the editorial boards of: Artificial Intelligence, the Constraint Journal, Journal of Artificial Intelligence Research and the Encyclopedia of AI. She was awarded the Presidential Young investigator award in 1991 and is a fellow of the American association of Artificial Intelligence.